Patrick Kujala wins Race One of the fifth round of the Lamborghini Blancpain Super Trofeo ongoing this weekend on the German Nürburgring track. The Finn racing under the Bonaldi Motorsport banner seized his seventh season's win staking a claim on the title. He preceded the Italian/Russian Antonelli Motorsport pair made up by Daniel Zampieri (who set his second pole in 2015) and Roman Mavlanov, and the young Italian Alberto di Folco (Raton Racing) who proved to be among the protagonists in the early stages of the race. Patric Niederhauser and Edoardo Liberati experienced a quite unlucky start of the weekend. The Swiss capable of setting the second fastest in qualify, led the pack till the compulsory pit stop gaining a 7" margin over the closest chaser Di Folco. Liberati however did not even manage to complete a lap once he rejoined the track, being forced to retire for a technical failure. Kujala thus exploited the situation and took the lead while behind him Di Folco and Zampieri dueled for P2 with Zampieri that edged. Sergio Campana and Fabrizio Crestani (Team Lazarus) managed P4. P5 and P7 went to Isaac Tutumlu-Jesse Anttila (Leipert Motorsport) and Shinya Michimi-Kei Cozzolino (Vincenzo Sospiri Racing) respectively. Thumb up for Loris Spinelli who managed to defend the P3 overall and the lead of the PRO-AM Class before handing the wheel to his new team-mate Alain Valente, later penalized with a drive through for speeding in the pit lane. The win went to Simone Pellegrinelli (Imperiale Racing), who took P6 overall. Mikhail Spiridonov and Roberto Silva who shared the wheel of the Kinetic Racing Team car won the AM Class while Andres Josephsohn and Ricardo Vera proved the best in the Gallardo AM Cup. 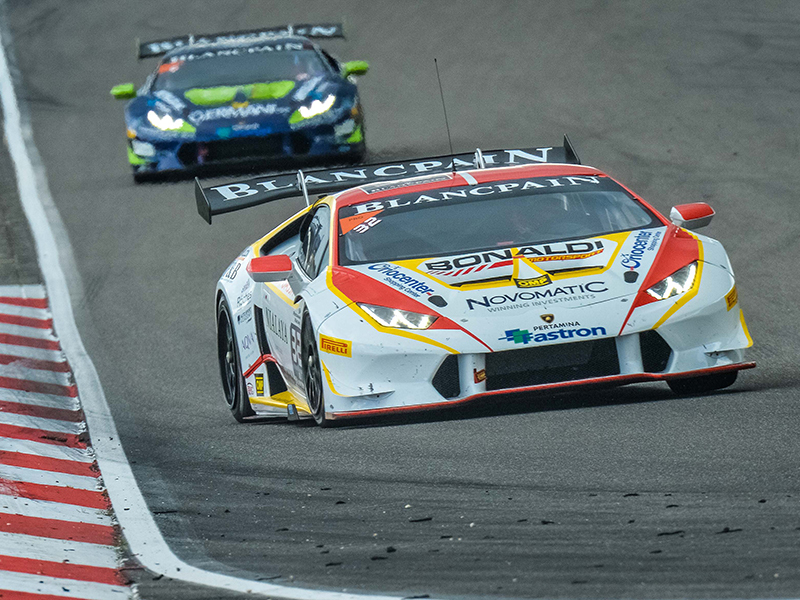 The fifth round of the season proved to be the ideal contest to announce the agreement reached with Sake Connection as a new partner of the Lamborghini Blancpain Super Trofeo. The prestigious Japanese company is already partner of the VSR Lamborghini Formula Junior Team connected to the Japanese F4 Championship. The next outing is in Race Two scheduled for tomorrow at 10.50 CET. Live Coverage in Italy will be provided by Nuvolari TV (Ch. 62 - cable) and in Europe on Motors TV.At the same time the race will be streamed live on the Lamborghini Squadra Corse website :http://squadracorse.lamborghini.com/en/live.